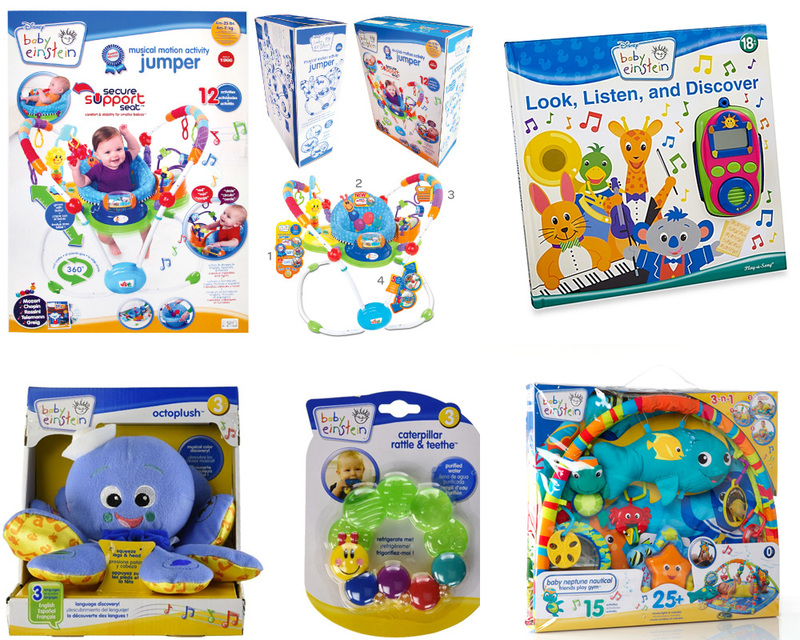 Launched in 1997 by former teacher and stay-at-home mom Julie Aigner-Clark, Baby Einstein is a line of multimedia products and toys for infants and toddlers. If you have a kid, you may have at some point been subjected to the completely mind-bending/numbing videos that started it all. If so, I’m sorry. Nonetheless, Baby Einstein quickly grew into a multi-million-dollar company and was sold to The Walt Disney Company in 2001 after hitting over $25 million in revenue that year. 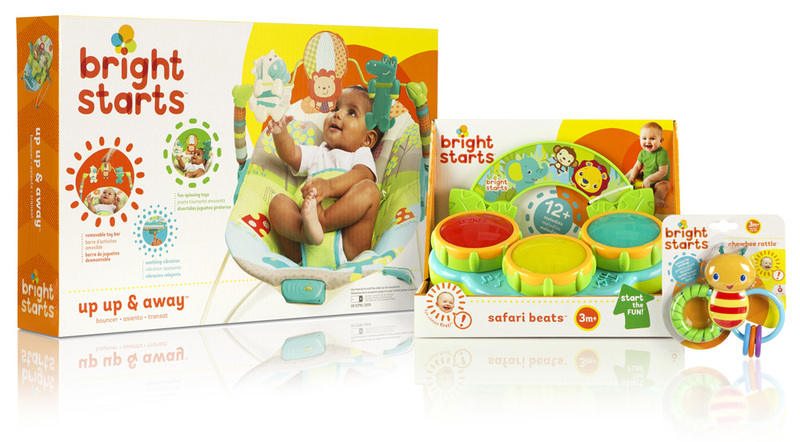 In 2013 Kids II, Inc., an infant and toddler product manufacturer based in Atlanta, GA, acquired Baby Einstein and added it to its array of brands that includes Bright Starts. Kids II has recently appointed Joe Duffy as their creative director and along with Duffy (the firm) they have introduced new logos and packaging for the flagship brands. 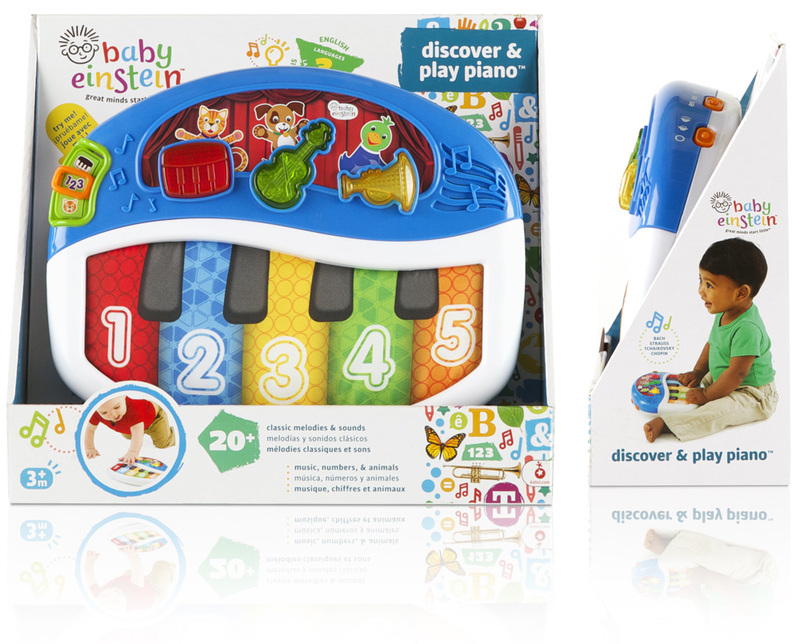 The brand revitalization of Baby Einstein coincides with the 20th anniversary of the iconic brand of developmental products designed to enrich baby’s young mind with a unique combination of language, music, art, animals and nature. The new visual identity is inspired by discovery and progressive learning. 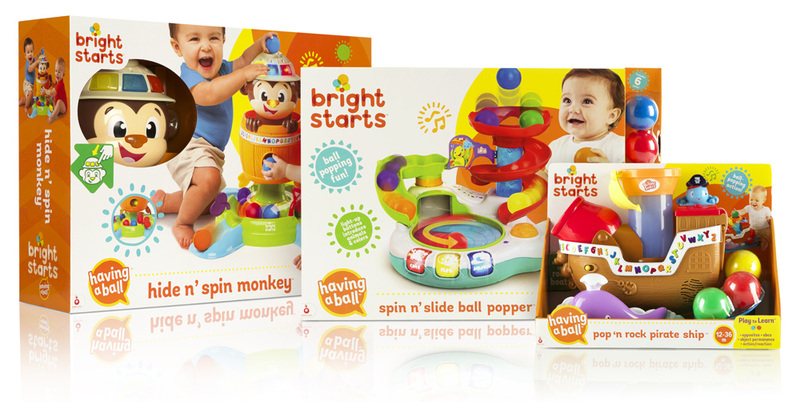 Bright Starts, a line of products designed to spark smiles and laughter in babies, is rebranded with simple, bright and amusing elements. You are probably thinking, “This? Baby Einstein on Brand New? For real?”. Yes, this stuff needs to be designed too and based on how the old logo and packaging looked it desperately needed to be redesigned. The old logo was as crude as the videos and even for a children’s products logo it was terrible, subscribing to the it-must-look-like-it-was-designed-by-children mentality that plagues most kids products. The new logo demonstrates how useless that approach can be with a logo that appeals to kids without it looking like it was made by one of them. It also makes it less painful for parents to spend money on those products. The new Einstein really starts to look like ol’ Albert as a kid, with a great expression and a wily head of rising hair. The typography isn’t to my predilection but it works. Major bonus points to Duffy for getting in a clever bit with the tittle of the “i” being made by the descender of the “y” above it. The new packaging can’t fully escape the let’s-put-as-much-info-on-the-box-as-possible approach but at least it’s well designed and bearable and there is no more VAG Rounded. 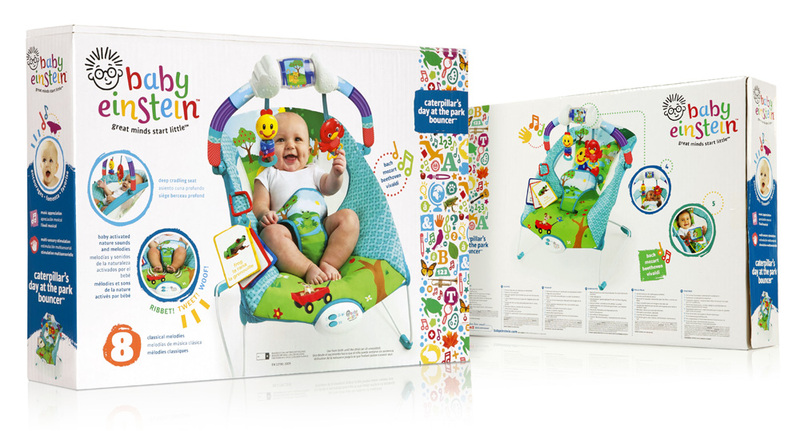 Designing packaging for mainstream kids products can’t be easy so to see something that’s relatively engaging is a win. Almost passing unperceived on the packaging is a cool pattern of letters and object debris that captures the randomized nature of the videos in a cool way. 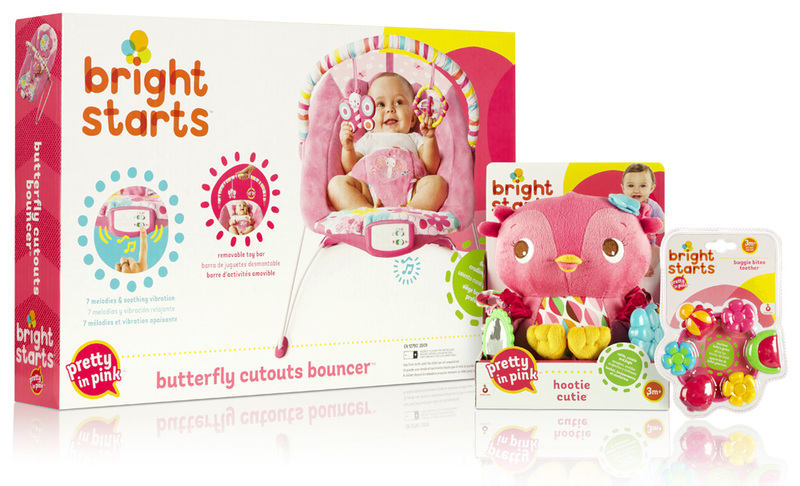 Bright Starts logo, before and after. The old Bright Starts logo looked like it belonged to a range of facial tissues or toilet paper. The new logo, made from simple but wonky letters, is more clearly a kids’ product. I like the overlaid concept but I wish it were something other than tone on tone. It wouldn’t have to be a rainbow of colors but something a little less Adobe-Illustrator-multiply-effect. Still, I like the uneven nature of the letters and how it’s not formulaic in where the overlaid bits land — sometimes right on the stem, sometimes off. 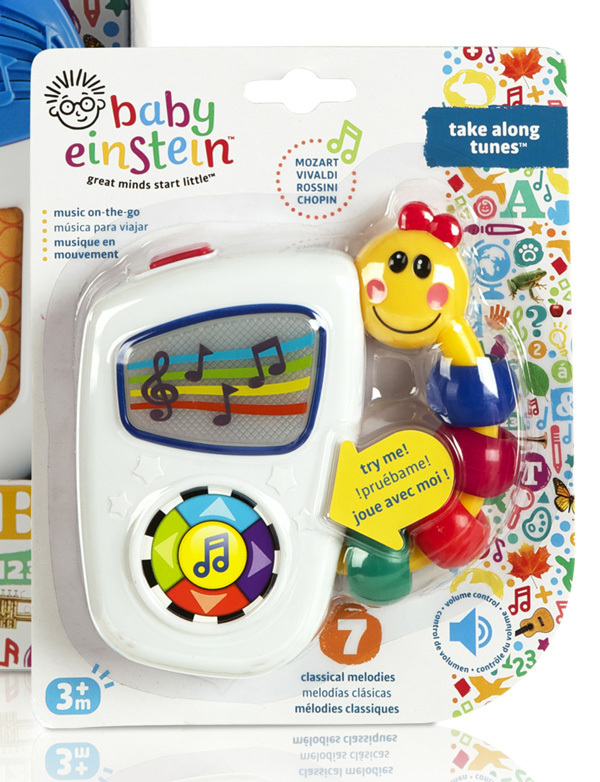 The old packaging was exactly what you would expect and very much in line with the old Baby Einstein packaging. Way too many things to look at and trying way too hard to be fun. The Bright Starts new packaging is particularly good, despite the obligatory product shots on it, it has some rather nice typography and supporting elements in the graphic bursts around the inset photographs. It’s still an assault on the eyes with info and pitches but it’s more pleasing and even entertaining. Overall, both revamps are a success — regardless of whether kids’ identity and packaging is or isn’t of interest to us — and more positively, the new packaging of both start to look like a family of products. (The templates for Brand New only allow for 3 polls, so we’ll vote on both sets of packaging). 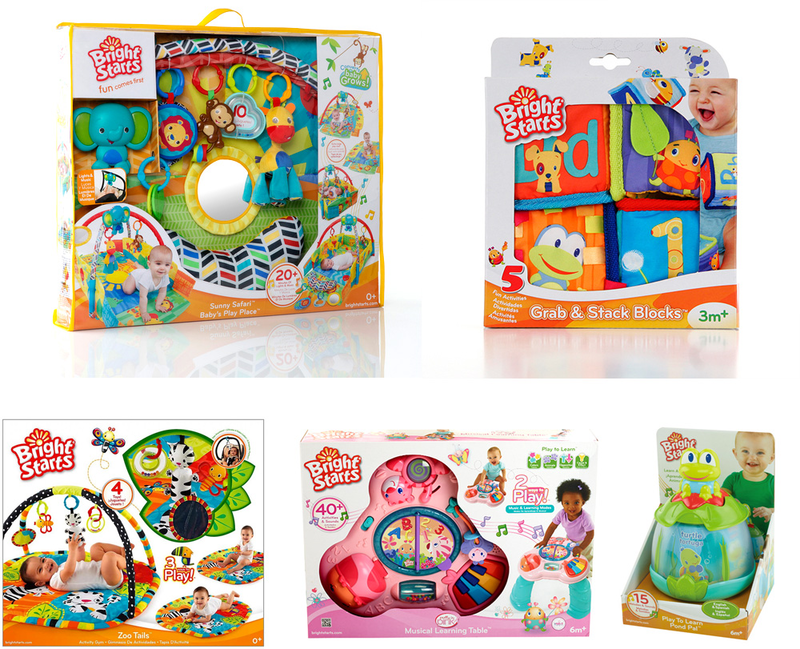 Launched in 1997 by former teacher and stay-at-home mom Julie Aigner-Clark, Baby Einstein is a line of multimedia products and toys for infants and toddlers. If you have a kid, you may have at some point been subjected to the completely mind-bending/numbing videos that started it all. If so, I'm sorry. Nonetheless, Baby Einstein quickly grew into a multi-million-dollar company and was sold to The Walt Disney Company in 2001 after hitting over \$25 million in revenue that year. 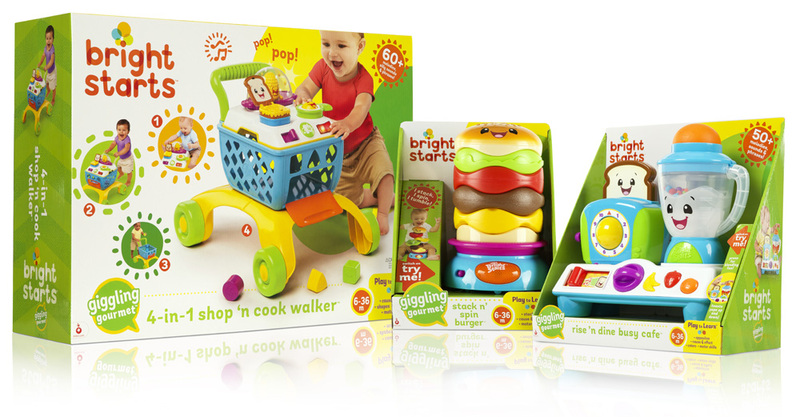 In 2013 Kids II, Inc., an infant and toddler product manufacturer based in Atlanta, GA, acquired Baby Einstein and added it to its array of brands that includes Bright Starts. Kids II has recently appointed Joe Duffy as their creative director and along with Duffy (the firm) they have introduced new logos and packaging for the flagship brands.